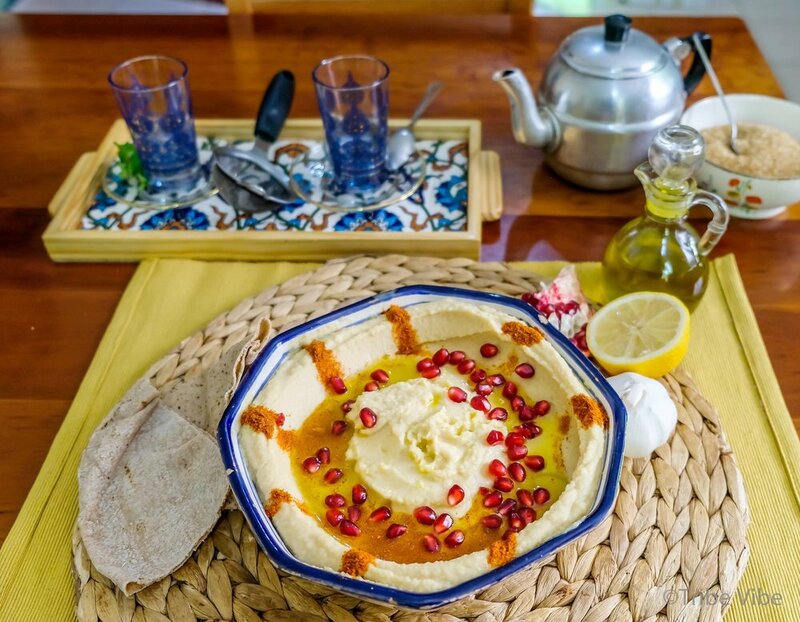 The Best Hummus You Will Ever Have-We Promise! 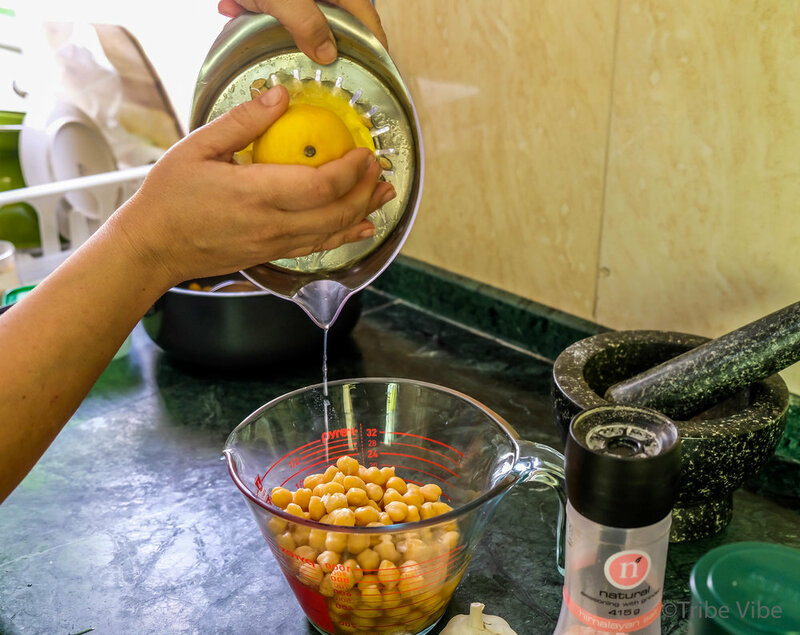 First, Pour the dried chickpeas into a large bowl and cover with at least three times the amount of water. The chickpeas will double in size so make sure your bowl is big enough. Add 1 tsp of soda bicarbonate to the water and stir in (this will help to ensure the chickpeas are not too tough.) Place a dish towel over the top and soak overnight. *Carmen's Advice - Soak a larger quantity than you need and freeze in a bit of the soaking water for quick use in the future. Second, rinse the soaked chickpeas very well. You want to make sure all the soda bicarbonate is rinsed off. 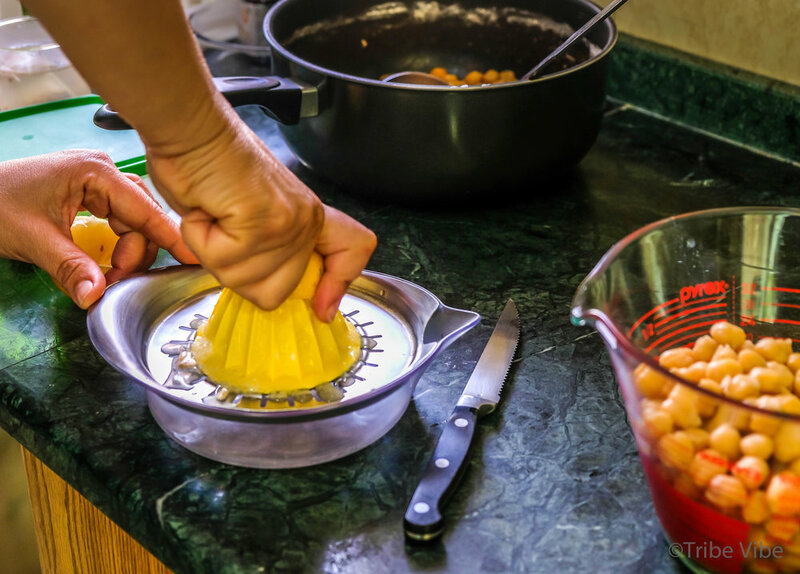 Place the rinsed chickpeas in a cooking pot and cover with water again. Bring to a low boil for about 1 hour, checking frequently for tenderness. When ready, the chickpeas should be soft to crush between your fingers. Third, place two heaping cups of chickpeas and half a cup of the water in which they were boiled into a bowl for blending (freeze the remaining chickpeas for later use.) If you want super smooth hummus, you can remove the thin skins at this point. However, this consumes a huge amount of time. In addition, the skins give a rustic texture. My view is to just leave them on and enjoy. Fourth, chop one clove of garlic and place in the bowl with chickpeas. Next, add one teaspoon of salt and increase to desired taste. Pour in the juice from one large lemon. Add two ice cubes- it will help make the hummus smoother. Blend all ingredients together with a hand blender until smooth. If the mixture is too thick, add a bit more of the liquid the chickpeas were cooked in. Fifth, pour in the tahini and mix well with a spoon. Do a taste test. Add a bit more salt, lemon, or tahini if you feel it needs it. Pour into your serving dish. (A shallow bowl with a wide opening works better than a deep bowl.) Flatten out the hummus in the bowl. Using the backside of a large spoon, form a trench around the edge of the hummus. Almost done. Now drizzle with olive oil and sprinkle with pomegranate seeds. Finish off by sprinkling the edges with chilly powder. Beautiful! Serve with Arabic bread or crackers and a hot cup of mint tea. Delicious!! The best hummus ever. Enjoy!